Casual keyboard users often don’t pay much attention to differences in keyboards. Most use whatever keyboard is available or buy one of the cheaper models. We were actually in this category of people until we discovered the significant differences in using a mechanical keyboard. Writers and hard-core gamers will tell you without hesitation that the best mechanical keyboard is the only option for them. If you’re at all like we were, you are probably wondering what could possibly be so different in a mechanical keyboard and regular keyboards with a membrane sheath. 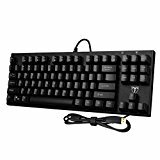 Or, you may already know a mechanical keyboard is what you want, and you just need a little help figuring out which one is the best buy for you. Hopefully, this guide will help you understand mechanical keyboards and the available functions and/or it will assist you in narrowing down your favorite one. 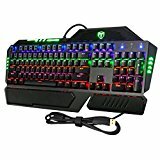 We will discuss the benefits of using mechanical keyboards, what features to look for, and list several ideal gaming mechanical keyboards in different price ranges. After a lot of research, we narrowed our top 3 gaming mechanical keyboards in 4 different categories. Along with the price range and features, we have added as much information as possible for each keyboard listed. We hope you find this guide helpful in your search for a new gaming mechanical keyboard. In this section below, we have listed 3 of the best high-end mechanical keyboards on the market. 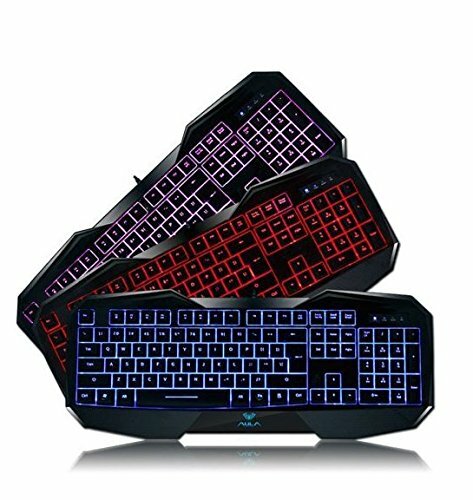 This is just our own opinion, and many others would have a different view on this, but really you can’t go wrong with these keyboards which are suitable for gaming. The Corsair is a great-looking keyboard in anodized black that is brushed with aluminum chassis. The backlit red LED has adjustable brightness and the ability to program individual keys to light up just the ones you need. You can even save combinations for different games directly to your keyboard. 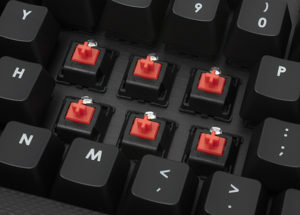 The 100% anti-ghosting 104 keys have Cherry MX red mechanical switches. This linear key response allows smooth and fast key pressing without the audible click. 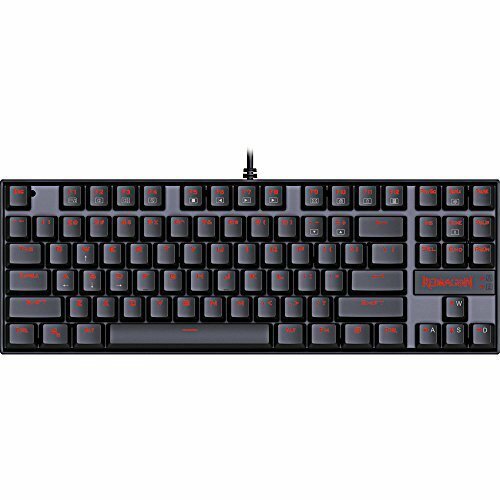 The integrated WASD keys along with function keys 1-6 are contoured and textured making them easy to locate in high-action and first person shooter games. 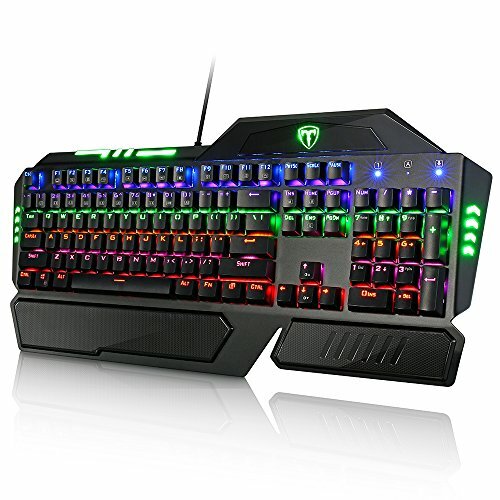 This keyboard has the durability hard-core gamers desire and is also wireless. The full-length wrist rest has a soft touch design and is detachable. An extra set of standard typing key caps and key removal tool for easy cleaning are included. Multi-media controls make it easy to adjust volume and more directly from the keyboard. The Corsair K70 works with Windows 7, 8, Vista, and XP. It requires 2 USB connectors. 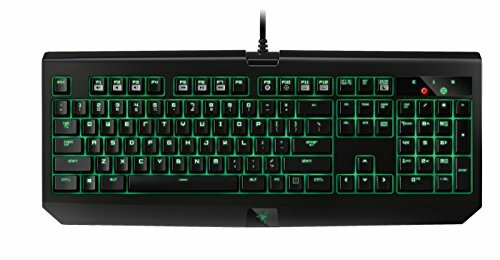 Razer developed every detail of their mechanical keyboard, and their own mechanical switches specifically for gamers. The Green Switch keys contain a tactile feel and have an actuation force of 50g. 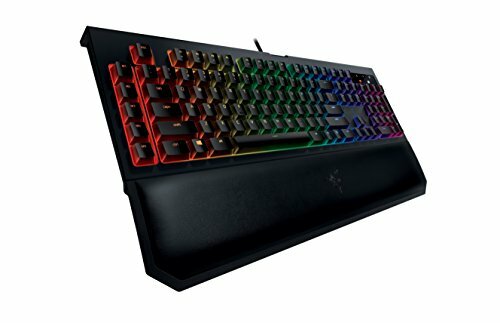 The Razer BlackWidow Chroma V2 has a back lighting function with over 16.8 million color options. The keys are fully programmable and include 5 macro keys. Easy access to the multi-media keys allows users to quickly adjust volume and media playback. It contains the 10 key rollover for anti-ghosting. The BlackWidow Chroma V2 is rated to last for 80 million keystrokes and comes with a 2-year warranty. It has USB, 3.5mm headphone, and microphone ports that allow easy cable setup. 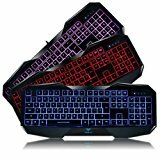 It is a popular gaming keyboard among serious gamers and is certain to not disappoint. The futuristic look of the Logitech Orion Spark is a bonus, and the exclusive Romer-G mechanical switches make it hard to beat. 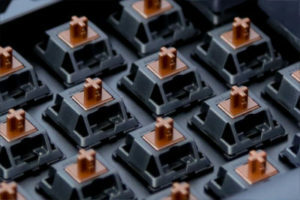 These switches have up to 25% faster actuation than most other keyboards. The RGB illuminator allows keys to be individually customized from a huge range of 16 million colors. 9 programmable G keys allow users to create custom game macros. Media controls are directly on the keyboard, and the 113 keys provide anti-ghosting. The Orion Spark contains Arx control applications and a smartphone dock. Users can access in-game date directly from their smartphones or tablets without interfering with their game. It is designed to withstand 70 million keystrokes making it a worthy investment. It has a wired connection and is compatible with Windows 10 or later, 7, 8.1, 8, Vista, and Mac OSX. The Pictek gaming keyboard contains 104 keys with n-key rollover which allows multiple keys to work together and prevents anti-ghosting. The ergonomic design contains blue Gaote switches which are sensitive, have a fast response time, and an audible click. Standing up to a 50 million keystroke test, this top-grade ABS and metal keyboard would make any gamer happy to own it. The key caps are removable and an included key cap puller makes it easier to clean. This shouldn’t happen often, as the Pictek keyboard is dust-proof and water resistant containing 5 drain holes. 9 backlight effects in 6 different colors are accessible by pressing the FN and Ins keys. Multimedia and shortcut keys are located within the function keys. This keyboard supports Windows 10, 8, 7, XP, Vista, and Mac OSX. No additional software is required for use. The Razer BlackWidow Ultimate Stealth is a popular choice amongst gamers due to its affordability and ideal features. The Razer Mechanical Switches have fully programmable keys with an additional 5 macro keys. Each key is individually backlit with improved lighting. The Razer’s keys have a distinct tactile feel and faster response. An audible click and 10-key rollover for anti-ghosting are also featured. The Razer Synapse Enabled feature syncs the keyboard to a cloud server allowing users to download driver and firmware updates. Users can also sync their custom settings and macro keys with a unified configurator. This allows users to customize all of their Razer products with a single login. Volume control and media playback are easily accessed with the integrated media keys. Tested at 60 million keystrokes, the Razer BlackWidow Stealth is an affordable and excellent choice in mechanical gaming keyboards. 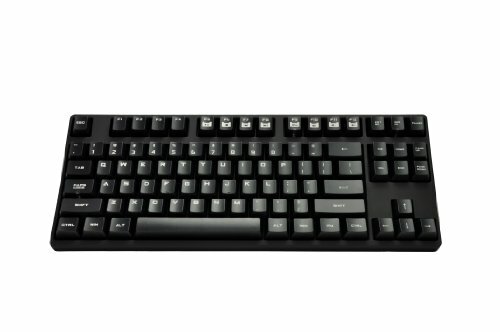 The CM Storm QuickFire incorporates the popular Cherry MX red switches for a smooth quick response with low resistance. The 87 keys have laser-etched key caps, and an additional 6 key caps are included with a key puller for easy cleaning. 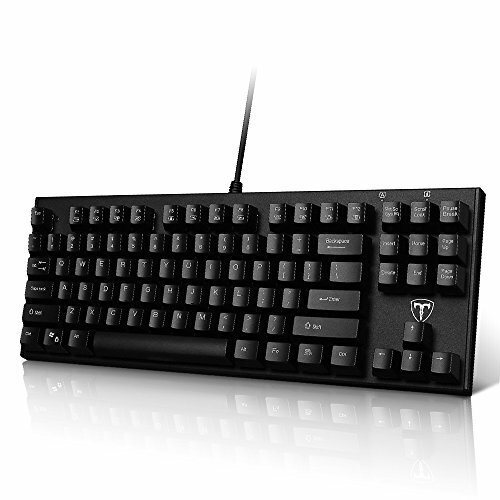 Other features include anti-ghosting, the Windows keys can be disabled during Game Mode, and the n-key rollover function allows multiple keys to be pressed at the same time without interruptions. Without the number pad, the design is more compact which creates more space for extra gaming gear. The QuickFire is affordable and is a great choice in gaming keyboards. Buying budget gaming keyboards doesn’t mean you have to give up all of the great features that the more expensive ones contain. It’s still possible to get the popular Cherry MX switches and backlighting. The Redragon Kumara is a perfect example. It incorporates the Cherry MX green switches with medium resistance, tactile feedback, and an audible click. The Kumara has red LED adjustable lighting, 87 standard keys with 100% anti-ghosting, and 12 multimedia keys. The WASD and arrow keys are switchable for specific apps and gaming. Made of aluminum and ABS construction, this keyboard supports Windows 10, 8, 7, Vista, XP, and later. The Tomoko keyboard contains Gaote blue switches for medium resistance, tactile feedback, and an audible click. It features the n-key rollover allowing multiple keys to work together without interruptions. It is anti-ghosting and water-resistant. A key cap puller is included for easy cleaning. Made of top-grade ABS and metal material, it has a matte finish texture and laser-engraved key characters. The compact, ergonomic keyboard tested at 50 million keystrokes. Multiple function keys allow easy access to the web, email, volume control, and more. This keyboard is compatible with Windows 10, 8, 7, XP, Vista, and Mac OSX. The Aula gaming keyboard contains brilliant backlit colors and blue switch keys for a comfortable touch, tactile feedback, and an audible click. The ergonomic design creates a more comfortable posture. Multi-functional F keys are also included. The easy plug and play makes it quick and painless to set up without the need for drivers. This keyboard supports Windows 2000, XP, 7, 8, 10, and Mac OS. It also includes a one-year product replacement warranty. 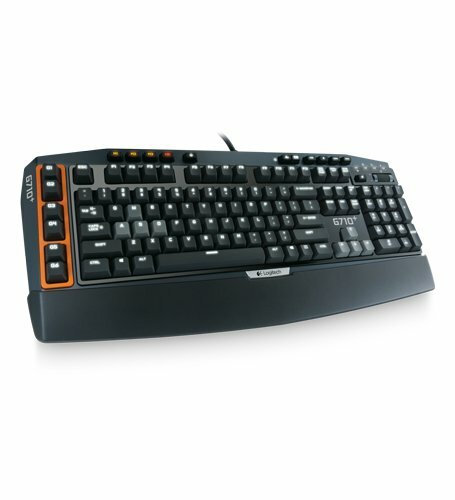 For gamers that do not like the audible click, there are several gaming keyboards available with the brown switches that remove the key sound. 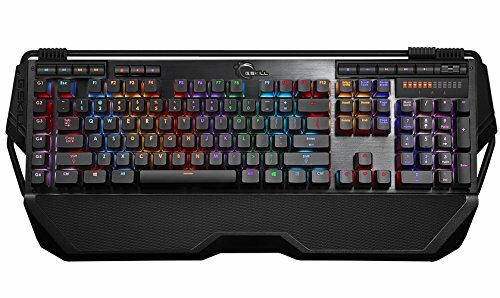 The CM Storm QuickFire is a tenkeyless gaming keyboard that incorporates the Cherry MX brown switches that have medium resistance, tactile feedback, and a fast response. It contains the n-key rollover function allowing multiple keys to be pressed at once without conflict. The 87 laser-etched keys provide anti-ghosting and have been tested to last for 50 million keystrokes. Windows keys can be disabled during game mode to avoid accidental key presses. Extra key caps and a key puller for easy cleaning are included. The design is compact without the number pad. This keyboard is compatible with Windows XP, Vista, 7, and 8. The Logitech G710+ contains high speed, quiet, tactile feedback key switches with adjustable dual-zone backlighting. Users can adjust the brightness of the WASD and arrow keys independently from the other keys in low light environments. 6 programmable G-keys allow users to configure up to 18 different functions per game. This includes single keypresses, complex macros, and detailed Lua scripts. The 110 anti-ghosting keys in addition to the 26-key rollover create a seamless gaming experience. Game or desktop modes allow users to disable windows and context keys during gaming. One-touch media keys and a removable palm rest are also included. This keyboard will sustain 50 million keypresses and is compatible with Windows 8, 7, Vista, and Mac OS x 10.6.8-19.9x. The G.SKILL Ripjaws keyboard also incorporates the Cherry MX key switches in brown allowing quiet, tactile feedback with each key press. Full RGB backlighting allows each key to be customized with a different backlight color. 6 built-in macro keys are available along with full per-key programming. Control multimedia with media keys and a volume roller. Up to 3 separate modes of keyboard layouts can be stored and switched between gaming styles. It has 100% anti-ghosting and n-key rollover. It is compatible with Windows 7, 8, 8.1, and 10. 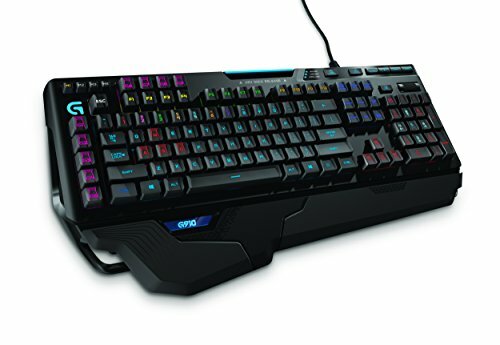 What are gaming mechanical keyboards? 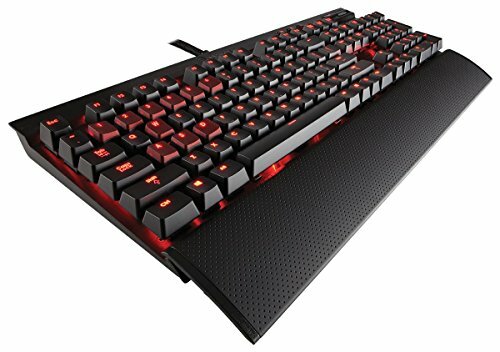 First, we’ll explain what a mechanical keyboard is, and then we’ll explain why some are geared more toward gamers and how they can enhance the gaming experience. The major difference in mechanical keyboards are the keys. Each key has an individual key switch mechanism that registers its keystroke. Membrane keyboards contain a cover that all the keys share. By having separate keys with their own switch mechanism, certain aspects of the typing feel can be created differently. These aspects are listed below along with a few other mechanical keyboard terms we will be discussing. One of the main reasons gamers insist on using mechanical keyboards is accuracy. They have the ability to pick and choose features that work well with the types of games often played. Response time is an important factor as well as macro key availability. Gamers have their own preference of key feel. Some like to know without a doubt that a certain key was pressed while immersed in a high-action game. And, others may feel strongly about a certain brand offering a short travel distance in keystrokes. The ability to customize their keyboard is very important as well. All of these features combined create a large variety of options for gamers to choose from. What are the benefits of using a mechanical keyboard? Mechanical keyboards offer users the ability to customize their keyboard in varying degrees depending on brand and price. Their length of use far surpasses membrane keyboards. Mechanical keyboards are designed to stand up to 50 million or more key presses. Membrane keyboard users often have to deal with the rubber degrading which causes sticky keys. Their key press life is right at around 10 million. So, while mechanical keyboards may cost a little more, they’re certain to last much longer. As far as maintenance, mechanical keyboards will allow you to easily remove individual keys for cleaning. With membrane keyboards, the rubber or silicone material often attracts dirt and the attachment methods make it harder to clean. There are a few more factors that require a little more explanation than simply listing in a bullet list we thought we should cover. One is the percentage which is the term for determining the size of a keyboard which can sometimes mutually connect to the features available. Next, is the different types of switches available that offer different key feels, noise, and tactile response. Last, is the option of macro key availability. We will dig into these terms a little deeper below. Mechanical keyboards contain keys that each have their own spring-loaded switch. They are designed to provide the user with excellent audio and tactile feedback. There are several varieties with each offering different features. Some keyboard brands only offer certain switch brands while other keyboard brands may offer a choice. 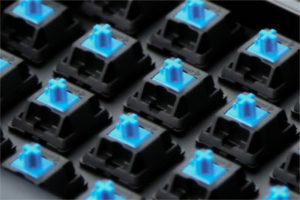 The Cherry MX switches are a very popular choice among gamers. Differentiated by color, the Cherry MX black has no tactile or audio feedback. This simply means you will not feel a bump upon activating the key nor will you hear any noise. The lack of tactile and noise makes this switch known as a linear switch. The travel distance also feels the same from the start of the keystroke to letting go. The Cherry MX blue switch has a slight bump and a clicking sound that you can hear upon key activation. This switch activates the key half way through the key press which requires less effort per keystroke. This switch is often preferred among writers. The Cherry MX brown is very similar to the blue but is much quieter. 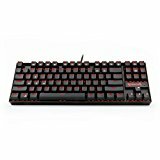 The Cherry MX red switches are especially popular among gamers as it has a higher actuation point allowing a faster response. 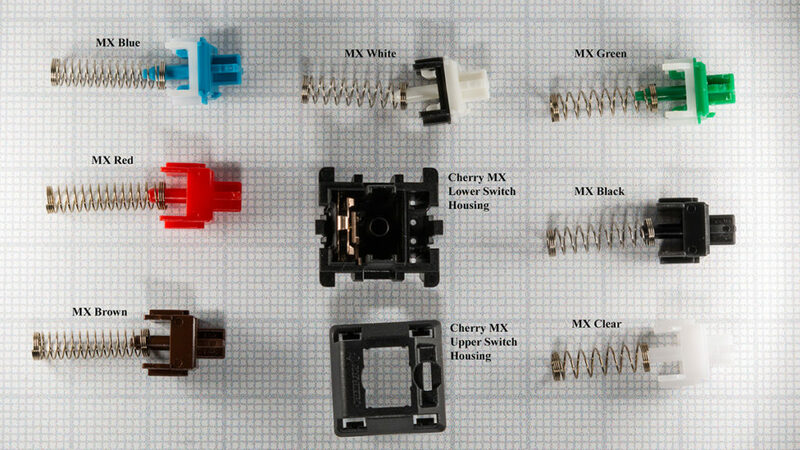 Topre, Buckling Switch, Kailh, and ALPS-mount are a few other known switch types. Check out this video to get a more detailed understanding of mechanical switches. Very popular in gaming, macro keys can be customized. When pressed, a saved sequence of commands or keyboard strokes can be recalled. This is an excellent feature for high-action gamers, but not all mechanical keyboards have them. If this is an important feature to you, be certain to check the keyboard specs before purchasing. After studying the different features, you should decide which ones will benefit you the most. These are the features most gamers consider when purchasing a new mechanical keyboard. We hope you have enjoyed this mechanical keyboard buying guide. We wish you the best of luck in deciding which keyboard will best suit your needs. Please check out our other guides on the best RGB keyboards if you’re going for a keyboard with a bit of color and excitement about it. If you have any questions about this post or mechanical keyboards then please feel free to leave a comment below, and I will try and answer it as soon as possible.